As owner of one of the state’s largest dairies, Logan County farmer Lee Robey is a very busy man. In the fall, he and his crew are all-hands-on-deck, as they work to harvest his grain crops in a timely manner to maintain optimum quality. Any unnecessary downtime could be a real inconvenience and detrimental to the harvest progress. 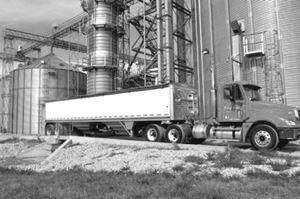 To make the harvest run smoother, Robey has taken some of his profits from the past few years of record grain prices and invested in on-farm storage. In the past four years, he’s nearly doubled his storage capacity. According to grain experts at the University of Kentucky College of Agriculture, Food and Environment, Robey is not the only Kentucky farmer seeing the benefits of adding on-farm storage structures. More Kentucky farmers are seeing the positives of on-farm storage this year as tight profit margins and high yields have forced some to rent storage or seek temporary or alternative storage structures in hopes of higher prices. An employee for Robey Farms unloads soybeans into Lee Robey's storage bins. While some producers may be feeling pressure to add on-farm storage structures to their farm, the decision to do so should be based on each individual’s situation, UKAg experts said. Developing a written marketing plan can also help producers market their grain more efficiently and more easily weather price fluctuations, Davis said.